I wonder what ever happened to Hansen? That is a LOT of battens! Maybe not. It said patent 'applied for'. Did a search and could not find any patent. Love to know what the stretch material is. You should take a patent on that quick! Then wait for the right sort of material to be invented with the correct elasticity and strength. I don't think it exists yet, but it maybe does in a secret back room somewhere? I find the same thing Choco....every time I copy something I find it's been done before, very frustrating. Patrick Deltheim who has done over 52kts at Luderitz was telling a local WA sailor that when rigging for speed he recommended adding 3 to 4cm extra downhaul than recommended, saying that the top of the sail's looser leech came into play when going deep down wind? 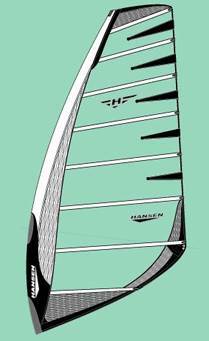 I see lots of people try find out why deep downwind speed raiders use so much twist. -Much more apparent wind shift happening between foot and head on downwind course than on upwind. 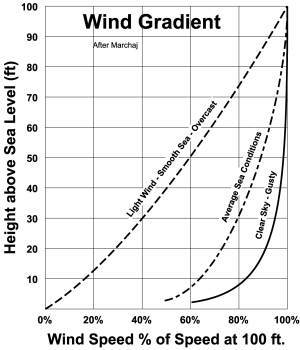 I agree that your basic concept is correct if the wind strength increases with height above the water. If this is true, then in a gust, the change in apparent wind direction is also going to be greater at the head than at the foot. However, your vector diagram implies that the wind at the foot is half the strength of the wind at the head. Do you have any data to back that up, or in fact to show that there is any significant difference in wind strength from foot to head? I agree that your basic concept is correct if the wind strength increases with height above the water. Yes key word is IF. If this is true,than concept is 100% correct. 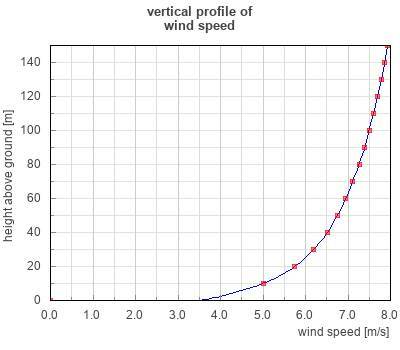 However, your vector diagram implies that the wind at the foot is half the strength of the wind at the head. This is just my example,you can choose whatever you want wind gradient difference between foot and head,but you will allways have larger twist angle on downwind,just with different amount. Do you have any data to back that up, or in fact to show that there is any significant difference in wind strength from foot to head? No I dont have any experimental data yet,only theoretical that you can find in any book.. 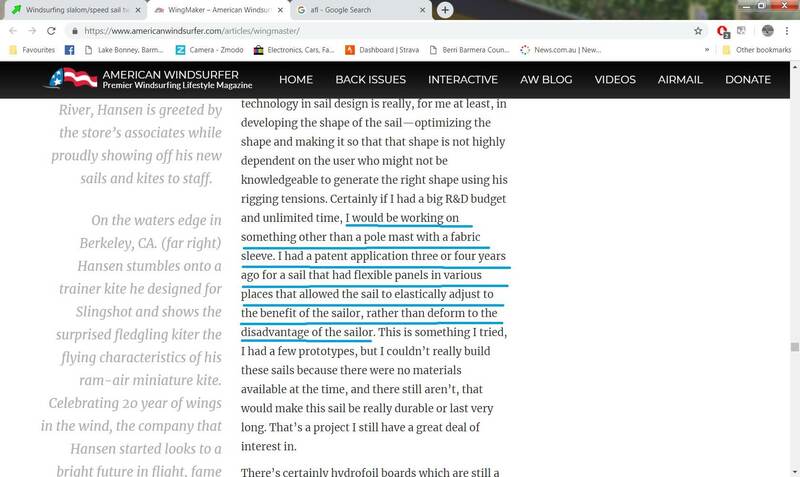 It is very easy to find out.You dont need any instrumenst.Just 6 meter rope where you will attached every 50cm one tell tales/or light rope/type.Take your windsurfing mast on boat,one end of rope connect to bow ,one to top of mast and start planning on windy day. If tell tales will not be parallel that mean that wind gradient exist within 5m height. I will do it ,just wait for some windy day ,than I can post my feedback.. Does anybody try this on this forum? There's plenty of profile measurements on google images. They all vary depending on conditions but with enough fetch over uniform roughness (or smoothness) they all settle to pretty much logarithmic. Half the strength between 1 metre and 4 metres looks possible from the google returns. These are all averages over minutes though. At any instant it could be reversed. Sailquick reports that the Luderitz channel has the low wind quite affected by the earthworks. Speed raiders, ( who coined that phrase? most apt) are not going all that much faster than the wind. Fiddling with USA46's diagram ( is the black arrow head on the wrong end?) you can see you'd theoretically need less twist on a relatively faster, taller craft where the foot of the sail might already be 1 metre above the water. That's above the most rapidly changing section of profile. That's probably why Sailquick reports not much twist on Macquarie innovation. Not that we've shown profile is the main reason for twist, but no harm in allowing for it. If profile was the only reason for twist the rate of twist would vary with height with most of it happening at the bottom. Our sails, with twist biased at the top, are upside down, but nothing is new. I'm familiar with the experiment, Manfred Curry did it in the 1930's using an International 14 dinghy, however he got negative results, no apparent skew in the telltales as they went up the mast. However I don't know whether he did the test multiple times in different conditions, he may have just struck a day where the layers were well mixed. Definitely worth re-doing the experiment at some of our speed-sailing spots. The other thing to take into consideration is that we don't just use geometrical twist, we also use aerodynamic twist, in that our sails are fuller at the foot than at the head, and in the case of speed sails, sometimes much fuller. The effect of this is that the angle of zero lift of the section at the foot and the section at the head are very different, and this is equivalent to the true twist being even greater. "If profile was the only reason for twist the rate of twist would vary with height with most of it happening at the bottom. Our sails, with twist biased at the top, are upside down, but nothing is new." Very very good observation.This is way I said this is controversial explanation. If we look at wind gradient picture 1 ,we can see that most of wind speed change happening from 0-1m.That mean we must have maximum twist in this zone.Obviously foot-power max camber zone(0-1m) do not have twist at all.So from this wind gradient picture 1 sail power zone(0-1m) must be in goood stall condition(airflow separate from low pressue side/leeward side of sail).. In reality that is not happening for sure.So we are on the beggining of controversial topic again! Experimet with rope and tell tales will tell the truth. The effect of this is that the angle of zero lift of the section at the foot and the section at the head are very different, and this is equivalent to the true twist being even greater. I think youre onto something there Pacey Im guessing here, but a certain AOA is best for lift. So due to the decreasing draft of sail from bottom to top. The AOA must increase towards the top due to the shallower draft?? Please explain some more. Not exactly. The AoA must stay the same for best lift. But that angle may change as you move up the mast higher. Hence the sail is twisted. That is IF this increase in wind speed is actually significant where we sail. Aerodynamic twist can be hard to wrap your head around, but its fairly straightforward. 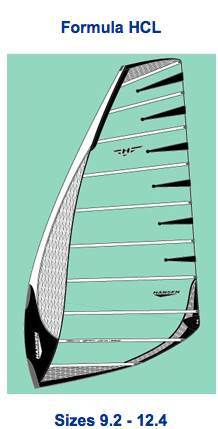 First, picture a sail with zero twist, but very full at the foot and almost dead flat at the head. If you set the geometric angle of attack to zero, the top of the sail will be feathering and producing no lift, but the bottom of the sail will still produce significant lift due to its camber. That means for the bottom of the sail to generate zero lift, it has to be rotated to a negative geometric angle of attack, but at this angle the head will be generating negative lift (keeping in mind that the foot and head are not geometrically twisted relative to one another). This is aerodynamic twist and is similar in its effects to the head and foot of the sail having the same percentage fullness, but being geometrically twisted relative to one another. 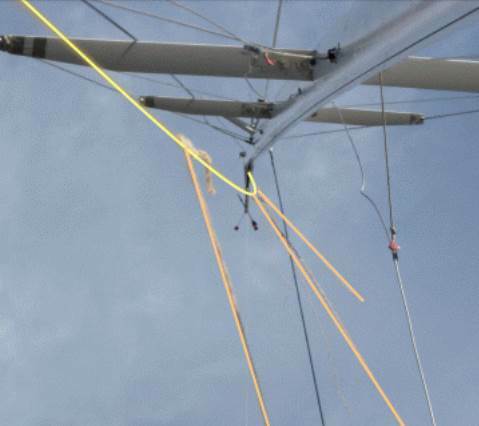 Having a full base to the sail and a flat head increases the effective twist seen by the air flowing past the sail, so with current rigs we are actually sailing with more true twist than we appreciate. sailquik said..>>>>That is IF this increase in wind speed is actually significant where we sail. It's certainly much less on mirror water, when there's laminar flow over the water. Mal Flew his kite at lake george and said he couldn't feel any difference in wind strength between water level and 25m up. With decrepit on this. 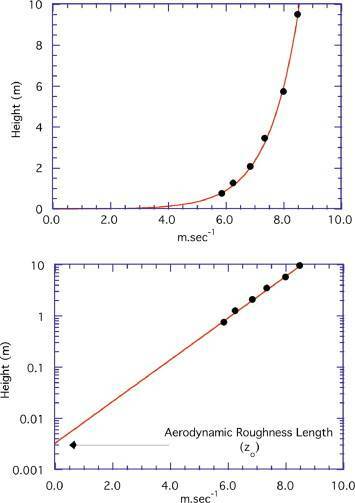 On flat surfaces, which is where speed is usually done there is little gradient. Most of the old literature on this was done on choppy harbours. Use this to generate profiles. The lowest value of roughness length you can put in is .0002 for water. Which is smoother than mown grass despite the chop build up. 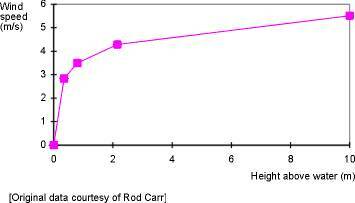 Not a precise science of course but this is the graph of the appropriate log profile for the smoothest you can get. Water is surprisingly low on the roughness scale despite the chop. 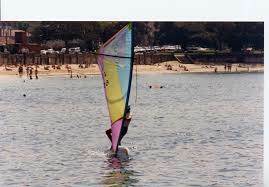 I asked a fellow from environmental mechanics who happened to be a windsurfer about this. He thought some sort of harmony between the wind and the chop that is generated by the wind made it act as if smoother than it looks. .Not as rough to the wind as what you might think when comparing it to similarly-sized random obstacles on land. He put down the drop of onshore wind in the surf zone to the waves pitching up and breaking into a non-harmonious state. We need actual data! Someone please place a bunch of wind meters on a pole, hook them up to a recorder, and stand in the water. Fangymay need a break from studying, he could do it! Or perhaps the simpler thing is to use a few wind wheels at different height, and film it. With clearly marked wheels and a high enough frame rate, it should be easy to see relative speed differences. In several feet of chop, it gets more complicated than the graphs suggest .. or at least, you can't just take the water surface as the origin. In a trough between waves, there's almost no wind close to the surface - trying to water start can get "interesting". Then on top of the wave, the sail gets ripped out of your hands, even though it's just barely above the peak of the chop. Not sure how that's relevant (other than that some pro slalom races are held in a lot of chop). Maybe it means control in different scenarios is more important than fitting to a single curve? That's a terrible curve! It means only kiters have a chance to go, since there's no wind near the water! 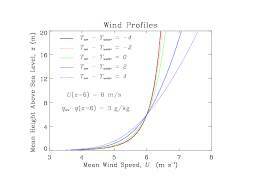 It would be interesting to know how wind strength and gradient relate. In the early summer, we often have stable gradients in lighter winds, meaning (like the graph shows) very little wind on the water, while the meters that are mounted 10 m above the surface show good numbers. Once the wind picks up beyond 20 knots, the wind seems to reach the surface a lot better. No need for expensive wind meters ,everbody who has boat and one rope can make measurment.Cost nothing. But Pacey already confirm that telltales will not show shift form apparent wind..
Do you have link about this topic? It was done by Lindsay Cunningham in the early 80's as well as I said earlier. Exactly that. A long pole with measuring points at intervals. I think he used some sort of Pitot tube technology, but nevertheless, he measured it to design the Yellow Pagses wing, and later Macquarie Innovation. Windshear! You've gone off on another tack. I suppose Speed Raiders can tune twist for just one of the two, but the topic heading does include slalom.